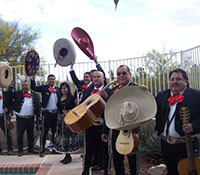 Add fun and excitement to your event with one of our exuberant mariachi bands. These traditional Mexican mariachis are guaranteed to have your guests on their feet and dancing to the lively beat. 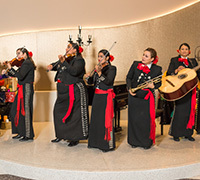 This versatile mariachi group is an exciting addition to any event. They stroll, play and sing; will even involve your guests with the 'Mexican Hat Dance' for an interactive fun experience. They perform as a trio or a quartet so they can best accommodate your musical needs. This exciting Mariachi band is the feminine counterpart to the beautiful southwest favorite. Our all female group goes toe to toe with the best of the Muchachos! Their look and sound is a delight, guaranteed to stir the passion in you. 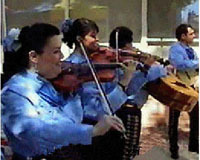 A female/male combination comprises this talented mariachi band that plays music of one of the most unique and beautiful genres found anywhere in the world. They are the perfect addition a lively Cinco de Mayo celebration, or that something extra that will add the flavor of Mexico to your next party!